This collection consists of records regarding Kyoto Protocol between 1997 and 1998. The collection contains correspondence, memoranda, talking points, statements, news articles, draft discussion papers, questions and answers (Q&As), resolutions, and email. The correspondence includes letters to and from senate and congressional members both in support of/or against the Kyoto Protocol. The memoranda contains material that relates to costs involved with the protocol, the strategy for signing the protocol, and information from some of the Conference of Parties (COP) meetings. The Q&As and talking points cover climate change testimonies and economic issues and the discussion papers are from policy advisors concerning the Kyoto Protocol. 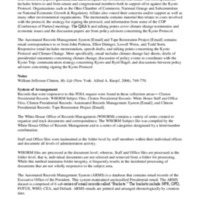 The emails consist of correspondence to or from John Podesta, Elliot Diringer, Lowell Weiss, and Todd Stern and include memorandums, speech drafts, and talking points concerning the Kyoto Protocol and Climate Change.